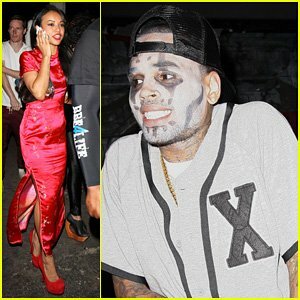 Home Tags Posts tagged with "halloween party"
Chris Brown picked a rather poor choice of costume as he got in the holiday spirit for Halloween, on Wednesday. Chris Brown, 23, dressed himself up as a gun toting Arab man complete with ammunition and thawb. It is unclear if Chris Brown was supposed to be a Sheik or some kind of terrorist, but his costume is sure to have raised some eyebrows. Chris Brown posted the picture on his Twitter account with him and his friends all wearing similar outfits and holding up toy machine guns and pistols. Their costumes, which included long fake beards, were seemingly an effort to look like stereotypical terrorists. He captioned the picture: “Ain’t nobody F***ing wit my clique!!!! #ohb,” which is a line from Kanye West song Clique. Chris Brown was dressed up to attend the party of his ex girlfriend Rihanna, which was being held at Greystone Manor Supperclub, in West Hollywood. He was clearly in the mood to enjoy himself as he arrived over an hour earlier than the host, Rihanna. Upon his arrival, Chris Brown was given a very warm welcome from one female admirer who showed off her legs in her ring master costume. While Chris Brown and Rihanna, who was crowned the Queen of West Hollywood Halloween Parade, have put their tumultuous history behind them, Irish rap trio Original Rudeboys have not. The group reportedly turned down an offer to perform with Chris Brown next month in Dublin, Ireland, because of his domestic abuse history with Rihanna. Under the cover of bizarre transparent mask, Robert Pattinson and Kristen Stewart were spotted holding hands at a Halloween party on Wednesday night. In an apparent sign they are growing closer following Kristen Stewart’s “indiscretion” with married director Rupert Sanders this summer, the couple were caught in a tactile moment while attending a bash at the Hollywood Forever Cemetery. It was a fleeting glimpse of affection, however, as the pair spent most of the night avoiding being photographed together, with the couple stepping apart whenever a camera was in sight. As for their Halloween costumes, R-Patz and Kristen Stewart didn’t exactly pull out all the stops. True to form, they made understated appearances in casual clothing – with only their masks serving as an attempt to dress up. Kristen Stewart, 22, wore wearing leggings and a green jacket, while R-Patz, 26, opted for his customary jeans and cap. The couple – who appear to have reconciled in the wake of Kristen Stewart’s cheating scandal with Rupert Sanders earlier this year – were joined at the event by other VIPs, including Minka Kelly and Chris Evans and Katy Perry. Rupert Sanders and wife Liberty Ross, meanwhile, made more of an effort with their costumes when they ventured out for a spot of trick or treating with their two children around their local neighborhood in Los Angeles. Kim Kardashian and Kanye West decided to take inspiration from The Dark Knight Rises and Batman Returns for their Halloween costumes on Wednesday evening. Kim Kardashian and Kanye West arrived at LIV at Fountainebleau Miami Beach to celebrate Kim’s Halloween birthday bash. The reality star looked pretty amazing in her replica Catwoman suit as she copied the Michelle Pfeiffer incarnation rather than the more recent Anne Hathaway version. The 32-year-old slipped her curves into the tight black PVC outfit and highlighted her pout with rouge lipstick. Feeling fully in character, she clawed at the camera several times as she imitated a cat and struck some seductive feline poses. With her leather boots on, Kim Kardashian arrived in style as she emerged from a gold Lamborghini with her rapper boyfriend dressed up as Batman. Kanye West, 35,who designs his own fashion range, could not compete with his famous girlfriend as he wore a simple Batman mask over a balaclava to hide his face. It wasn’t just Kim Kardashian and Kanye West who were part of the comic book theme as Scott Disick, Kourtney Kardashian and Jonathan Cheban got in on the act too. Scott Disick was dressed as a less than convincing Robin, in the classic red and green suit, but he didn’t wear a mask and completed the outfit with red trainers. His partner Kourtney Kardashian faired better as Batgirl as she showed off her post baby body in the black Lycra costume. Kim Kardashian’s good friend Jonathan Cheban was the villain of the night as he dressed up as the Riddler and sprayed his hair red. Other guests at the party included Hulk Hogan who wore a bright yellow and orange feathered boa, seemingly attending as himself. Three women have died in a stampede at a Halloween party in Madrid, Spanish officials say. They say that two more people were seriously injured at the gathering at the Madrid Arena. It was not immediately known what caused the crush, but reports suggest the panic began after a flare was thrown in the crowd. The building, which can house up to 10,000 people, was evacuated after the incident. Two of the victims were 18 years old, while the third was 25, Spanish police say. “There was a human crush at the only exit they had because the others were sealed off,” a partygoer – who gave her name as Sandra – told Spain’s Cadena Ser radio station. The stampede recalled a mass panic at the Love Parade music festival in Germany that killed 21 people in 2010. At least 4 people have been wounded in a shooting incident at a Halloween party at the University of Southern California (USC), in Los Angeles. 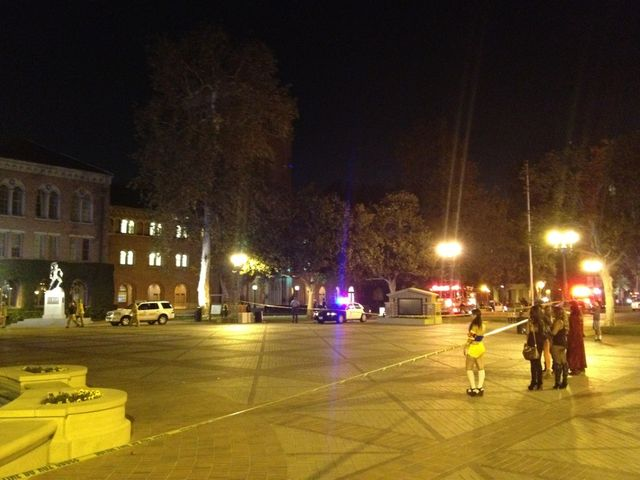 Campus news outlet Neon Tommy said the incident took place at 23:30 local time. Police confirmed that there were casualties. At least one suspect has been detained. The university shut down the campus and urged students to stay away from the area of the shooting, amid earlier reports of a gunman at large. Witnesses reported a “mob of people” fleeing from the main campus building. “Everyone started running. I saw a guy who was shot in the leg. He was limping and screaming for his friends to help him,” one witness said, quoted by the Los Angeles Times newspaper. USC’s Department of Public Safety issued alerts asking students to stay away from the area, stay indoors and avoid opening the door to strangers. In 2008, University of Southern California sprinter Bryshon Nellum was shot in the leg three times at a Halloween party just off the campus. Bryshon Nellum recovered and won a silver medal in the 4 x 400 m relay at the London 2012 Olympics.